What is required to enter Costa Rica? Visitors from the United States, Canada, and most European countries need to present a valid passport when entering, or leaving, Costa Rica. A tourist visa, which is a stamp on your passport, is issued for 90 days. When entering Costa Rica you may (but not always) also be asked to demonstrate how you will pay for your stay as well; ie: cash, credit card etc. You will also need to fill out a declaration form regarding what you are bringing into the country. These are available on whatever flight you are on or, if traveling by land, at the immigration windows at the borders of Panama or Nicaragua. What are Costa Rica's major airports? Costa Rica has two international airports - Juan Santamaria (SJO) in Alajuela, in the Central Valley and another in Liberia (LIR) in North Guanacaste. There are many small airports throughout the country as well. These are serviced by domestic airlines Nature Air and Sansa. See our map of airports. If you are departing via air, there is a $28 departure tax. This can be paid at the airport with either cash or a credit card. There is no tax when departing by land or sea. Costa Rica's "high season" is between December and April during the "dry"season. It is quite dry and areas like Guanacaste can be brown and dusty. The "green" season, or rainy season, is between April and November. It rarely rains all day and will more often be sunny in the morning and early afternoon with afternoon showers and beautiful evenings. It is also the season for the best hotel rates, fewer people, and a lush, green countryside. Costa Rica'sclimate is temperate tropical with by two seasons: the dry season (December- April) and the wet or "Green" season (May-November). Average year-round temperature is between 71°F and 81°F. During the rainy season, also known as the green season, mornings are generally sunny followed by late afternoon showers. Because of it's geographical location, Costa Rica is usually not affected by hurricanes on either the Atlantic or Pacific coasts. Hurricanes spawned in the Caribbean basin can increase rainfall in the country and send swells that bring great waves to surf, but direct hits are a rarity. Is it necessary to rent a car in Costa Rica? If you plan to stay in one place or to visit only one or two areas using public transportation or a private shuttle are viable options. Public buses are quite inexpensive but are crowded, limited in luggage space, especially for things like surfboards, and can be long arduous trips. You do, however, get to see the countryside and often stop in towns that will give you a taste of the "real" Costa Rica as opposed to the tourist places. Most often you will need to use a local taxi after arriving at your destination. Private shuttles offer door to door service to where you are headed but can be $40 and up per person, each way. Either way, once you arrive at your destination you will usually need to arrange for local transportation to get around. Renting a car is a relatively easy process and driving is a fantastic way to see Costa Rica. Just remember that relatively short distances can take a longer time to drive than you might think. You will need a valid driver's license from where you live, your passport, and a credit card. The deposit held on your credit card will usually be $2000 and you need to remember that the deposit amount will be frozen, and unusable until you settle your rental bill. Also, make sure to check your vehicle for every dent or any damage that might already exist otherwise you will be charged with causing it. As in the States, it is best to return it with a full tank of fuel and when fueling up remember that all gas stations charge the same government-set price. Check out our Car Rental page for the car rental companies in Costa Rica. Do I need an International license to drive in Costa Rica? No. Your valid driver's license from your home country is all you will need. You should carry your passport or copy of your passport ID page, and the entry stamp page that shows proof of legal status in the country while driving. Will I need to rent a 4X4 vehicle? How are the roads? Driving is a fantastic way to see Costa Rica and over the past ten years the highway and road system has been significantly upgraded. During the dry season (December through April), most places are very accessible, though you might run into potholes and washboard gravel roads if you stray very far from the main roads. During the "green season" (rainy) if you plan to stray off the main highways, a 4X4 is probably a good idea but not essential. If you plan to surf areas that are remote, or visit areas such as Monteverde, a 4X4 is pretty much a must. Dirt roads can get very muddy and landslides and flooding are commonplace. How much does gas cost in Costa Rica? Currently super unleaded is about $5.50/gallon, regular unleaded is about $5.37/gallon and diesel is about $4.90/gallon. Gas prices are set by the government and all gas comes from the same suppliers and gas prices are the same at all stations - no need to shop around. The answer is yes, but you might want to be a little careful in remote areas, especially after big rains. Bottled water is readily available. Typical Costa Rica cuisine (check out our Costa Rica Food section) is generally savory and mildly spiced, if at all. Spicy food is not the norm and rice, beans, and local vegetables and fruits are common at all meals. The "casada", which translates as married, is a plate with a choice of meat, rice and beans, a vegetable and a salad is a traditional type of meal. A casada, in a "soda", a small local restaurant, will cost between $4 and $6 and includes a natural fruit drink. A typical Costa Rican Breakfast will be eggs, gallo pinto (a rice and bean combo usually with onion, green peppers, and "Lizano", a popular Costa Rica sauce), tortillas, and coffee and is quite satisfying. Of course, there are restaurants that serve up great food from all over the world. You can locate restaurants of all kinds that are available in the different areas of Costa Rica in our Hotels and Restaurants section. Is Internet available throughout the country? Today internet is available pretty much everywhere. Most hotels have free WiFi and/or computers and internet available to guests for free. There are also internet cafes in most towns for about $1/hr. That will depend on you provider and plan. If you do not have international service with your provider you can purchase a pre-paid sim card, phone card, or even renta phone for your time in country. Almost all are available at the airport upon arrival. Costa Ricans do study very basic English in school and many can say a few words but not much more, but many, if not most, Ticos that work in the tourist industry speak at least basic conversational English and can communicate well. In high tourist areas many people will speak to you in English but in the more rural areas people speak only their native Spanish. Costa Ricans are generally pretty friendly and will almost always try to help you communicate. A smile and the use of hand gestures goes a long way but carrying an English-Spanish dictionary definitely helps. Knowing basic situational words and phrases are really a plus. Check our Surfzone Spanish Lessons section. We have written and audio lessons of basic Spanish for situations such as in a restaurant, taxi, or bank. Can I use my credit cards in Costa Rica? Pretty much most hotels, restaurants, and stores accept Visa and Mastercard. Some accept American Express and other cards but not always. Outside the tourist areas many stores and restaurants only accept cash so it is wise be prepared with. In some situations you may be charged extra for the use of your card. There is a Money Exchange at the airport but the exchange is considerably higher than a a bank. It is best to do your money exchange at a local bank. You will need your passport when you do this. If you absolutely need to exchange money at the airport just get the minimum you need until you can get to a bank. Airport taxi drivers will accept dollars. 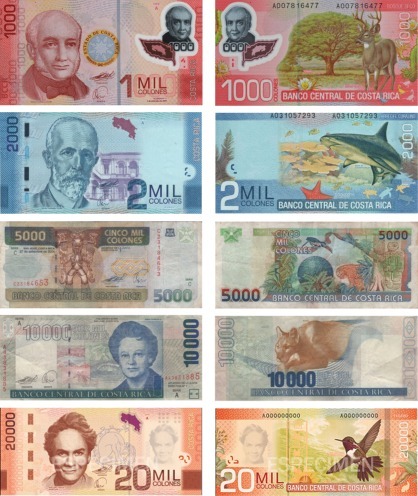 How much do I tip in Costa Rica? Tipping is not the norm in Costa Rica, but in the tourism industry tipping for professional services is universal. It is considered polite to tip guides and drivers for performance and services rendered. There is no set norm and it is your personal decision but a tour guide may be tipped $2-$10, depending on the size of your group. Be prepared for your restaurant bills. All bills have a 13% tax and a 10% tip added on to them. The prices on the menu are usually marked as to whether they include these charges but if you do see that information, ask about it. In high tourist areas some restaurants will purposely not include that they have included the 10% tip because they know that many tourists, especially those from the U.S., are accustomed to normally leaving a 10%-20% tip. Make sure you ask about the tip if it is not written on the tab otherwise you may end up tipping up to 30%. So, as a guide, compared to Eastern Standard Time, Costa Rica is 2 hours behind when the U.S. east coast is in daylight savings and 1 hour behind when it is not. Are there any vaccines that are mandatory to enter Costa Rica? The biggest concern is probably Dengue Fever. It is a mosquito transmitted virus that is common in tropical areas of the world. If you plan to spend time in the tropical areas of Costa Rica, especially the Caribbean and South Pacific areas, be sure to bring a good bug spray with deet. Can I take my pet to Costa Rica? Yes, it is a relatively simple process to bring a dog or cat to Costa Rica. These pets are not subject to quarantine, provided they have the correct paperwork and vaccines however birds, snakes, horses and other “exotic” or agricultural animals may be subject to additional restrictions. Are the parks and reserves wheelchair accessible? At this time Poas Volcano National Park is the only park that is completely wheelchair accessible, though some sections of other reserves are wheelchair friendly. It is best to call in advance to determine park conditions and trail possibilities. Yes, Costa Rica is well serviced by two domestic regional airlines, Sanza and Nature Air (see our Domestic Airlines page for flight schedules). Many areas have small airports (see our airport map) that are regularly serviced. Sanza flies out of the international airport in Alajuela and Nature Air from the regional airport located in Pavas. See maps below for directions. Is there an national emergency telephone number? Costa Rica has excellent medical services, both public and private. Local pharmacies can take care of most minor health problems. They are required to have a licensed pharmacist on staff a who can diagnose minor illnesses and prescribe medication. Public hospitals are staffed with very good doctors and surgeons but are somewhat lacking in state-of-the-art facilities. Private hospitals such as Hospital CIMA, Hospital Clinica Biblia, and Hospital Catolica in the San Jose area are completely modern state-of-the-art facilities and accept private insurance. What is the attitude toward gays and lesbians in Costa Rica? Costa Rica is a popular destination for gay travel in Latin America and actually has a very large local gay population. Many tourism destinations are gay-friendly, but keep in mind that Costa Rica is a Catholic country and sexuality can be a sensitive topic. Costa Rica’s two most gay-friendly locations are San Jose and Manuel Antonio. Costa Rica has a a reputation as a safe travel destination but crime, including violent crime, has been rising steadily. Generally in most tourist areas traveling alone, for both women and men, is safe. Obviously, as in all tourist areas around the world, travelers should take normal precautions to safeguard themselves and their belongings. Latin American men are very "machismo" and forward with women so that should always be taken into consideration when dealing with catcalls, whistling, and advances. The key is to be careful and aware. See our U.S. Embassy Notices page.